Today we ran in the 18th Annual Novi Sad Half Marathon. Novi Sad is the second city of Serbia and is about 70 kilometers north of Belgrade. Conditions were perfect with cool overcast skies, with temperatures in the 60’s and a very flat course. I finished in 153rd place (out of 295) and ran a personal best 1 hour 44 minutes and 42 seconds.My previous best was last year in Budapest when I ran a 1:57. Nadia broke 2:00 hours again and finished with a with a 1 hour 58 minutes and 31seconds. This was good for a 238 place. Our friend Eric also broke two hours with a time of 1:51 and another ISB Harrier, Georganne ran 1:30. The course was a bit monotanous as it looped back on itself several times. I liked that it was completely flat. It also started and ended in the beautiful central plaza. We took the nanny and kids and they had a good time at the McDonald’s, or the Team USA pre- & post- race training center. 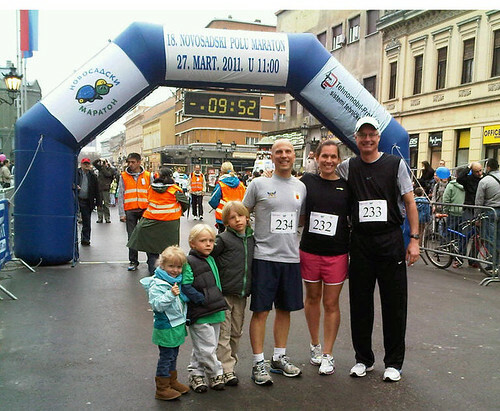 We used the race as a warm-up to next month’s Belgrade Marathon. I hope to complete a racing trifecta by also doing the Skopje, Macedonia Marathon in May. 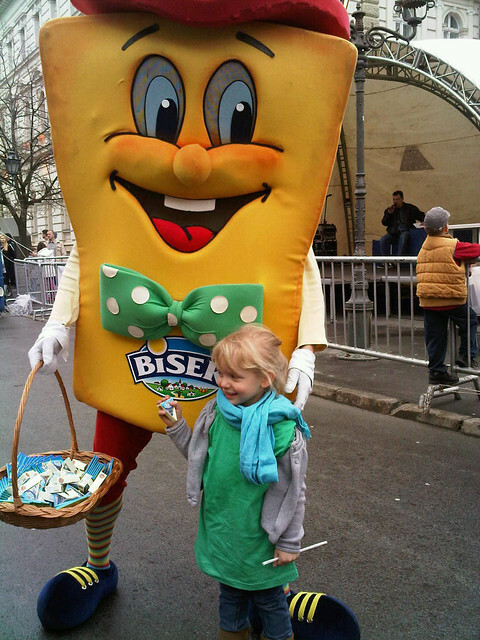 One of the race sponsors was the cheese company, Biser. They gave the kids Novi Sad Marathon shirts and Ocean, who loves cheese, was so excited to meet “Sir Milan.” I called him that as a take on Sponge Bob. Sir is Serbian for cheese, and Milan is a common Serbian name. Great news, if you weren’t aware…the course was shore by.14 of a mile. So I’m sure you were over a minute faster!!! I imagine you were a low 1:43! Now, the question is can you PR in Belgrade with the uphill climb at the end?? YES…!!!! Thanks! I’ve been too busy at work to run much since Novi Sad. I hope to run a decent time. Those hills are a killer.